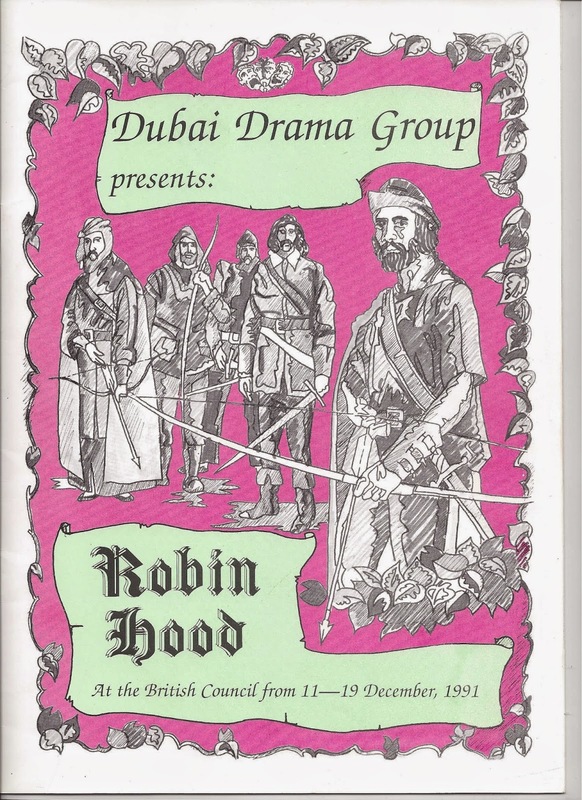 In the summer of 1990, I was invited to join the Dubai Drama Group. This didn't come a moment too soon. I needed something to do, besides going to pubs, parties and balls. The Dubai Drama Group was a blessing in easily recognizable disguise. 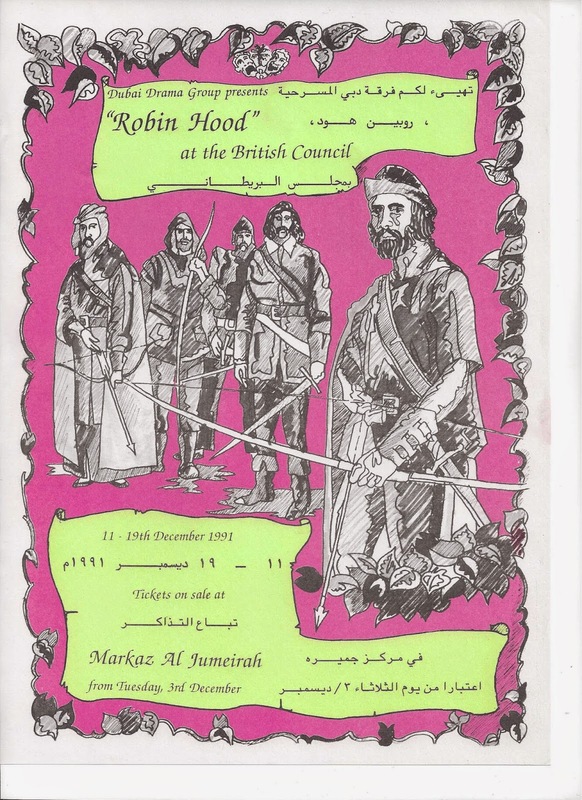 At first I wasn't much involved in the group productions, just the socials, but in November 1991, this predominantly English theatre company began preparing for ROBIN HOOD, its annual Christmas pantomime. Ah, the pantomime, a strictly British entertainment. Many professional theatres in the UK still produce an annual panto. They're very popular with amateur dramatic societies, or AMDRAMS, and the Dubai Drama Group was nothing if not an AMDRAM. 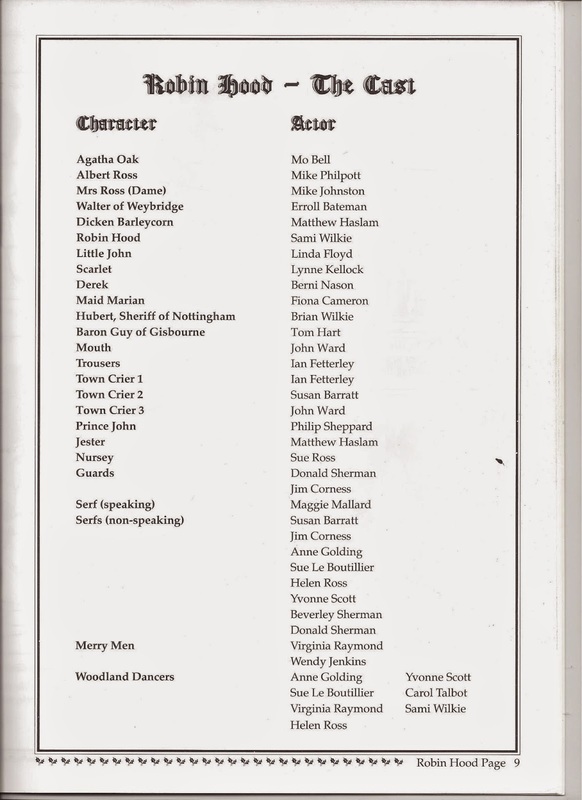 I was cast as Derek - a merry man - a small "but significant" role. I was happy as long as I got to frolic about in green tights and jaunty jerkin! I had ten proper lines, and in one scene, I had six words, all of which were, "Well?" I was in all the Sherwood Forest scenes and was surprised how difficult it was to be on stage when you have nothing to say. I tended to face the audience with my arms limp at my side, an insipid smile on my silly face. To combat this, I developed some facial expressions and practiced, "How not to Stand Around like a Gumby" at home. At the last minute, a dance number was added: lots of thigh slapping and stepping on and off logs, all to the tune of the Gary Glitter hit, "Do you wanna be in my gang, my gang, d'ya wanna be in my gang, oh yeah!" A less Glittery, more miserable gang of Merry Men, you would never wish to meet. By dress rehearsal, I still didn't know the dance routine and had no idea where to make my first entrance. We had a full house made up of kids from Al Noor and Asseef Schools for the mentally handicapped. They got a free show; we got a appreciative audience, who chattered throughout and laughed at everything, whether funny or not. Opening night was more frightening than having a machine-gun held to my head or hiding from the Libyan Morality Police. I didn't dare eat; I'd already lost my lunch from both ends. I stared longingly at the exit, and thought: "I could leave now. No one would miss me, my ten lines, my six 'wells.' I don't want to be an actress; I want to be a secretary." I heard, "Places!" and broke into a cold sweat, a regular theatrical occurrence in years to come. I went into a kind-of sickly trance. Then the lights went down, I took a deep breath, and stepped forward along with the other merry men. I was completely blinded by the lights, exactly as I'd heard would happen. No worries--I didn't want to see the audience anyway. However, after a short while, they began to emerge from the gloom. Frozen by stage fright, I couldn't remember a single instruction. Even my ears had stage fright; I couldn't hear anything. It's possible that I didn't say my lines. Somehow I managed to get off stage. Our next scene: the song and dance number. Please kill me now, I thought. Our log was set stage right, ready for us to pick up as we went on stage, but no one told me that the log had been painted black since dress rehearsal and in the black-out, I couldn't see it. I somehow fell right over it and onto my hands and knees. There was a lot of scrambling in the dark during which I lost my sense of direction altogether. I kept reaching for the hand holes on the log but it wasn't until I hit a wall that I realized the log had gone. As the lights went up, I was still messing about in the wings when I heard my stage gang begin the song: I'd missed an entrance in my very first show. I ran to join the routine but was so discombobulated, I never quite got into rhythm. It was actor's nightmare, like being naked on stage or learning lines for the wrong show. I hated myself; I knew the audience hated me too. They were as quiet as church mice and it was all my fault. I just wanted to die. It did get better (it had to, didn't it?) and then the ad-libbing started, which was all very well for the seasoned panto peeps, but mortifying for me. Every time a fellow actor changed a line, even if it wasn't my cue, I'd stand there with my mouth agape, transfixed with horror. My mind would go completely blank. Nothing new or extra was available to me once I was out on stage. I never lost the stage fright but it eased off once we mastered the dance, for which we got resounding cheers by closing night. Also by closing, I'd mastered a different way of delivering each of my "wells" (in fact, I'd added three more) and they were making people laugh. This made me truly happy! Word on the street was that ROBIN HOOD was the group's "best panto ever" so I was proud to have been a part of it: my very first show.